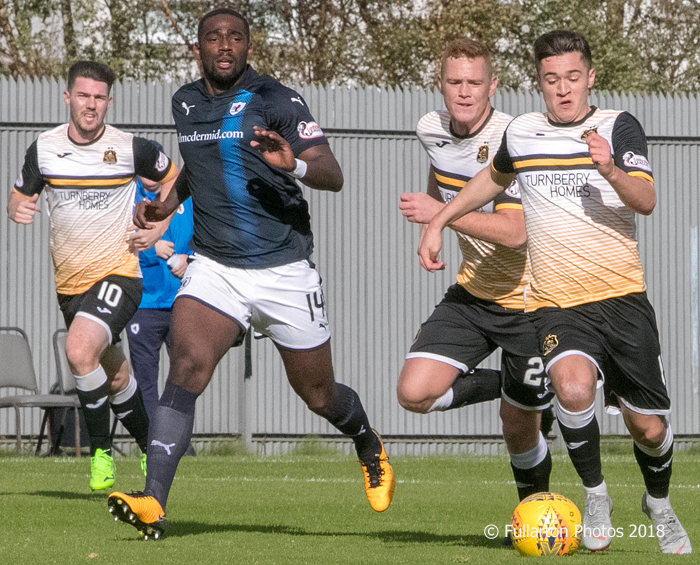 DUMBARTON faced gale force winds against Raith Rovers at the C & G Systems Stadium in the first half — and lost four goals. It was a strange decision after winning the toss, and the outcome was that the 775 crowd saw ex-Son Lewis Vaughan opening the scoring for the visitors in just 24 seconds. Three more went in before the interval, but it was not the fault of young keeper Jamie McGowan who was playing his first full match of the season because of an injury to Grant Adam. On 12 minutes Raith were two up. A well worked corner fell to Nathan Flanagan at the edge of the box, and his fiery effort cracked down off the upright and across the line. Flanagan grabbed his second and Rovers' third goal on 32 minutes, firing home from close range after an unfortunate rebound from a Dumbarton clearance. Kevin Nisbet, who played for Sons last season, inflicted further damage when he tapped home a fourth for Raith four minutes later. Iain Russell came on for Kyle Hutton after half time, and immediately started to make a significant difference for the home side. While Raith had chances to add to their tally, Dumbarton could also have grabbed a goal — but a fabulous save from keeper Robbie Thomson prevented Jack Aitchison from pulling one back on 50 minutes. Then on 70 minutes Calum Gallagher, replacing Ross Forbes, glanced home a superb header to make it 4-1, following more fine work from Russell. Dumbarton hunted more goals from an improved second half display, but any hopes of a revival were thoroughly crushed when Liam Buchanan twisted and turned to squeeze in a fifth goal on 86 minutes. The picture shows Jack Aitchison outpacing Nat Wedderburn.